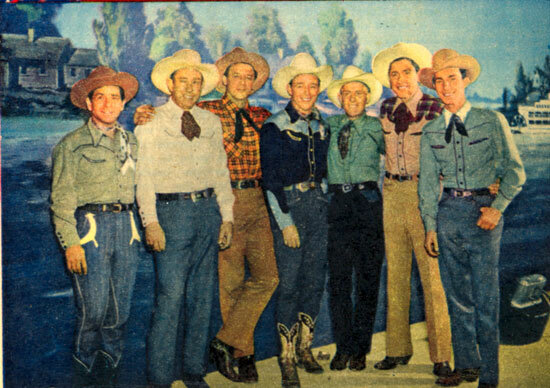 Roy Rogers with the Sons of the Pioneers (L-R) Shug Fisher, Karl Farr, Bob Nolan, Roy, Tim Spencer, Hugh Farr, Ken Carson. 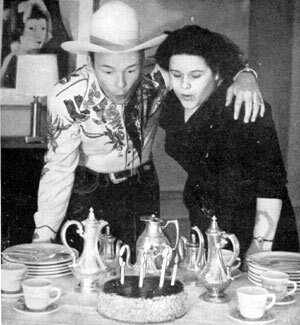 Roy with his fan club president Gene Ernst in June 1946, the 6th birthday of the RRFC. 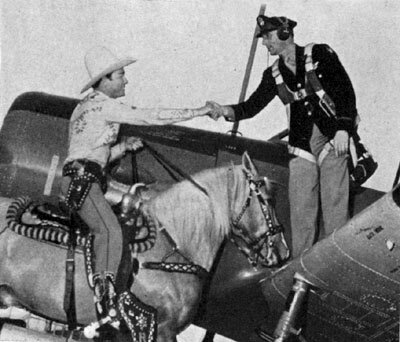 The King of the Cowboys meets the King of the Air, Col. John T. Sprague of the Waco Air Base in Waco, TX, during Roy's visit there to entertain service men in 1943. There’s certainly no “feud” here as Republic’s two top cowboys shake hands. 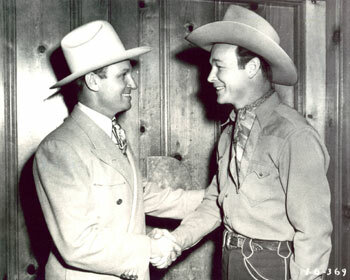 Gene Autry and Roy Rogers. 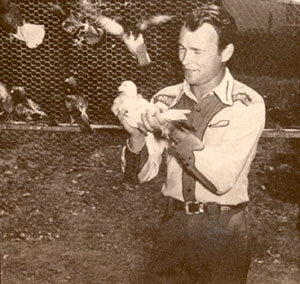 Roy took great pride in his cote of homing pigeons, having about 200 birds which he used to enter in pigeon races and occasionally rented out to movie studios where they more than earned their keep. 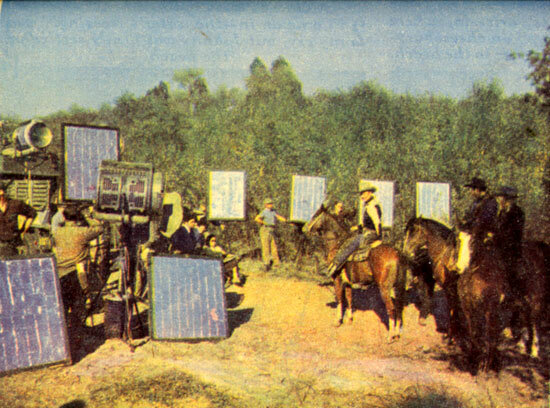 Roy’s pigeons were also drafted into the Army Signal Corps. 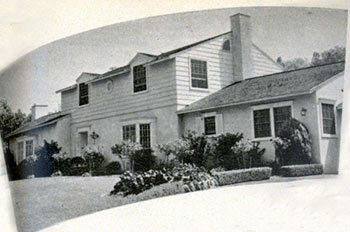 Roy and Arline's home in 1944 at 3734 Longridge Ave., Van Nuys, CA. 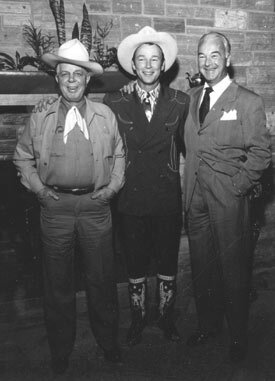 Hoot Gibson, Roy and William Boyd at Roy’s house. 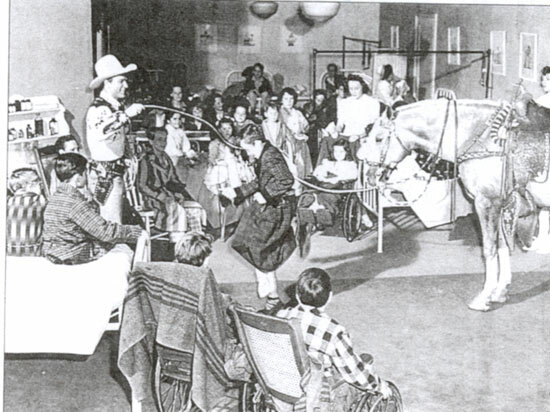 Taken during a rehearsal for the “Western Hall of Fame Hoss Opera” held at L.A.’s Olympic Auditorium 11/28/48. 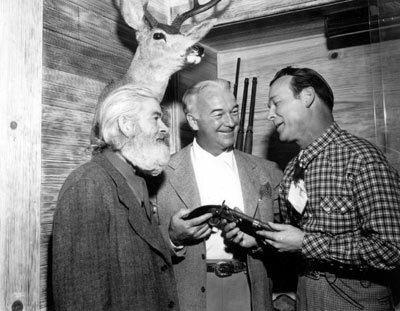 Gabby Hayes, William Boyd and Roy Rogers during a rehearsal at Roy’s house for the “Western Hall of Fame Hoss Opera” held at L.A.’s Olympic Auditorium 11/28/48. 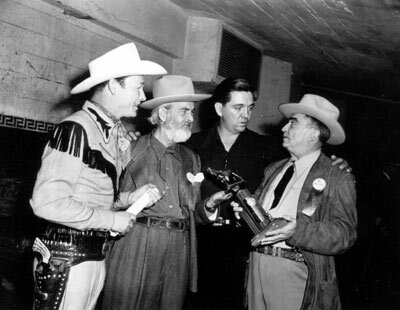 L.A. Sheriff Gene Biscailuz shows Roy, Gabby Hayes and Stuart Hamblin the award to be used at the “Western Hall of Fame Hoss Opera” held at L.A.’s Olympic Auditorium 11/28/48. 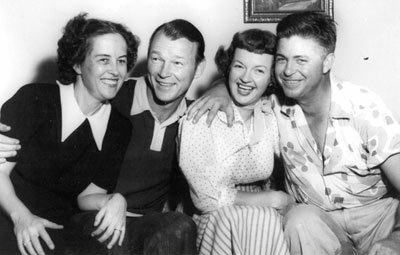 Roy and Dale with Marjorie Bingham-Bowron. 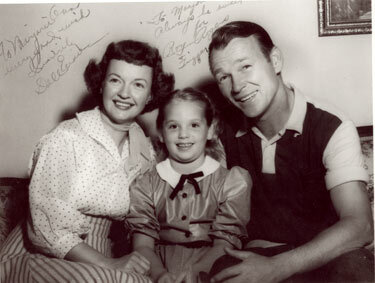 Notice that this photo was obviously taken at the same time as the one above (Roy and Dale’s clothing and picture on the wall). 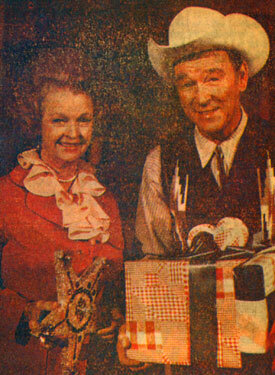 Promo photo of Roy and Dale taken at the time The Roy Rogers Museum was connected to the Apple Valley Inn in Apple Valley, CA. 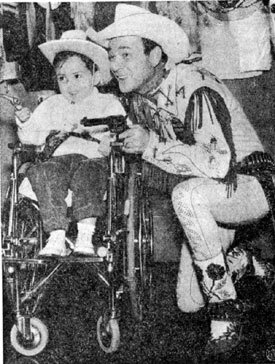 Roy with Alan Kowalsky, the 1958 poster child for the Muscular Dystrophy Association of America. 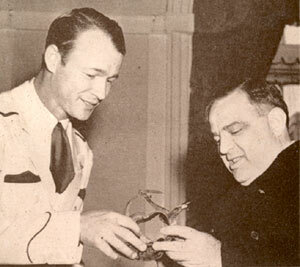 Roy and Alan draw a bead on the dreaded disease for the MDAA’s anual fund raising drive in Kenosha, WI, on Nov. 15, 1958. 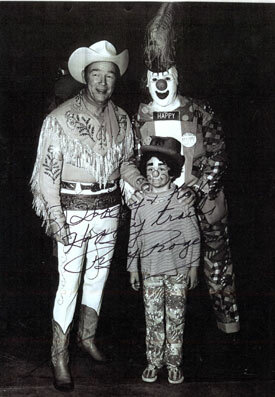 Roy with Happy the Clown (Dave Twomey). 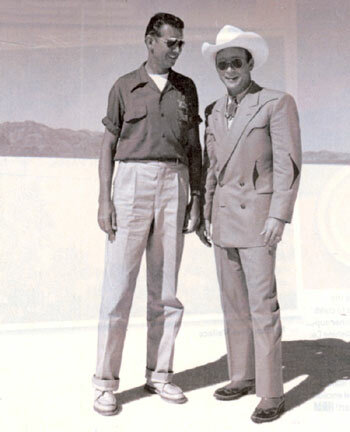 Roy with Wally Parks, president of the National Hot Rod Association at Salt Flats in Nevada. 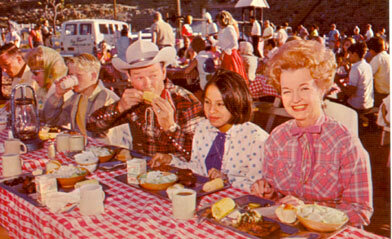 Parks (1913-2007) was instrumental in establishing drag racing a s a legit amateur and pro motorsport. 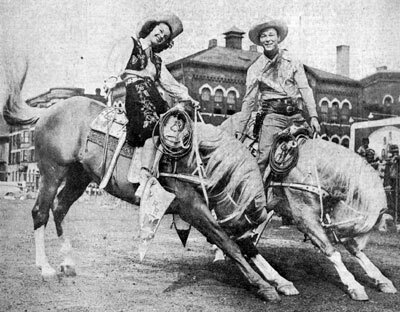 In 1947, Roy and Dale give children of Brown Elementary School an unexpected treat as they pose for the camera at Chicago Stadium where Roy's rodeo opened the next night. 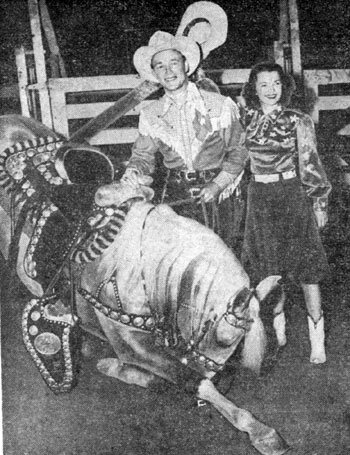 Roy on location for “Under California Stars” in 1948. Note all the tin foil light reflectors. 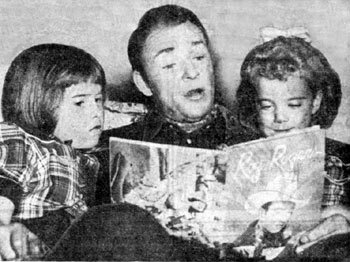 Roy entertains daughters Cheryl (left) and Linda Lou (right) by reading some of his comic book adventures from ROY ROGERS Dell #1 (1948). 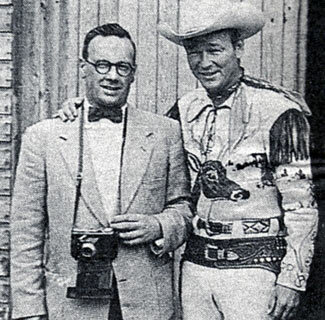 Roy, Dale and Trigger performed at Chicago Stadium in Oct. 1947.
a NY visit in 1943. 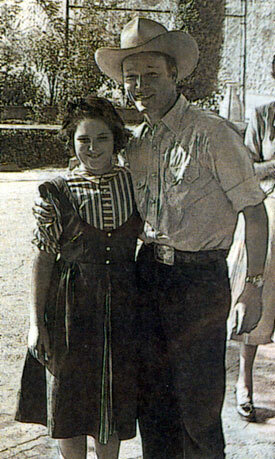 Roy and Dale while filming “A Country Christmas” which aired on CBS-TV on December 7, 1978.